With the perfect location in downtown Saugatuck, Twin Oaks Inn is the ideal place to stay. Innkeepers Sherry and Lisa recently remodeled Twin Oaks to add modern furnishings and conveniences while keeping the charm of this 1860 historical home intact. Park your car in our private parking lot; Twin Oaks is just steps from all of the shops, art galleries, and restaurants Saugatuck has to offer. We are also less than two miles from downtown Douglas and Saugatuck’s Oval Beach. The bed and breakfast offers six spacious guest rooms, each featuring a king or queen bed, private bath, and many modern amenities you would expect in an upscale hotel. A full breakfast is served daily in our beautiful dining room and during the warmer months on the cozy screened-in porch and private outdoor patio. Guests will enjoy our wet bar area which offers a selection of coffees and gourmet teas as well as a microwave, ice machine, and refrigerator. Twin Oaks Inn is a member of the Professional Association of Innkeepers (PAII) and Saugatuck-Douglas Area Business Association. We are also proud to be a partner of West Michigan Tourist Association. 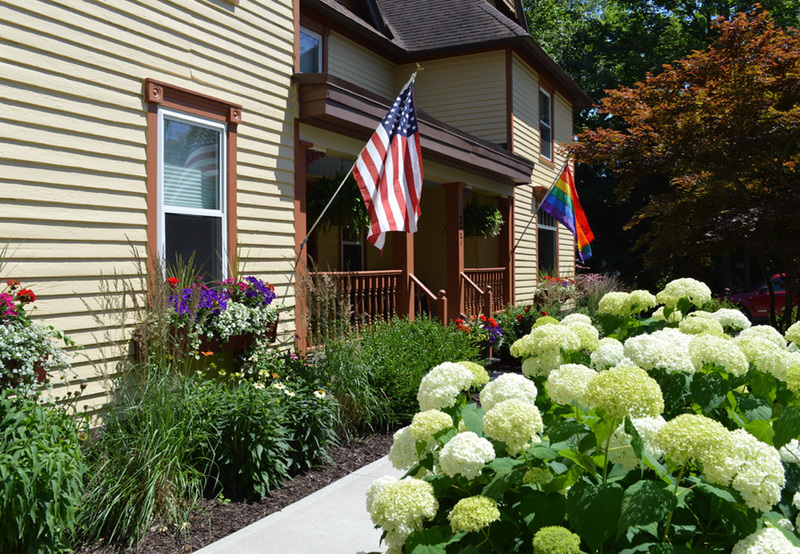 The inn has operated as a bed and breakfast since 1989 and it was acquired by its current owners, Sherry Forbes and Lisa Stafford, in October 2013. It’s our understanding that the home housed lumbermen who were working in the area, and we had a few visitors tell us that they remember it as an apartment building when they were children. Twin Oaks Inn was established as a bed and breakfast in 1989. Innkeepers Lisa and Sherry are the third owners of Twin Oaks.